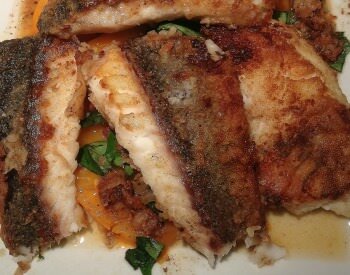 Try out these delicious bass recipes for a great tasting meal. Or cook up an awesome shoreline lunch on your boating or camping trip. These fun fish recipe dishes can be used for either your largemouth bass recipes, smallmouth bass and other varieties of black bass, as well as many other types of fresh lean fish. Combine the lemon zest, 2 tablespoons olive oil, thyme, and a dash of salt and pepper to taste. Reserve about 2 teaspoons for the veggies. Rub the remaining ingredients onto the bass fillets on both sides. In a medium sized bowl, combine the vegetables, reserved seasoning mixture and 1 tablespoon of olive oil, then toss together to evenly coat. Add the vegetables to a shallow baking dish of about 10" x 15" x 2". Place the fish fillets on the bed of vegetables and cover with aluminum foil. In a 400° pre-heated oven, place the baking pan on the center rack and bake for 15-20 minutes, or until the fish is done by testing with a fork for flakiness. Remove and serve immediately. Pour about 3 tablespoons of olive oil into a large skillet and cook the bacon over low heat. Remove the bacon and let it cool on the side. Combine the flour and seasonings together in a bowl. Coat the bass fillets with the flour mixture and shake off the excess. Add the fillets to the bacon flavored oil over medium heat and cook for about 3-4 minutes per side until golden brown or until done. Remove fillets and garnish with crumbled bacon pieces and lemon wedges. Normally, I prefer catch and release when freshwater fishing for largemouth and smallmouth bass. However, there are times when the fish swallow the hook too deep and they bleed to the point where they don't have a chance to survive. Rather than wasting the freshly caught bass, we've put together these bass fish recipes for when those moments arise. 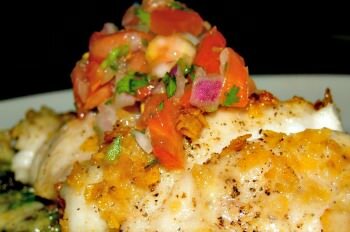 Tip: Although some species of fish can be easily substituted for these recipes, I would like to recommend double checking on the chilean seabass. The chilean seabass is known to contain high amounts of mercury and is rated as to avoid eating. You can check out the Seafood Watch website for more information about the seafood watch on the chilean seabass as well as many other species of fish. You'll be able to find out which fish to avoid, good alternatives, and the best choices.